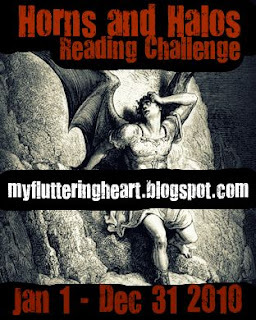 I’ve decided to join the Horns and Halos 2010 Reading Challenge at my fluttering heart. 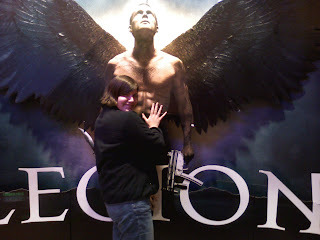 The idea is to commit to spend part of 2010 reading about (or watching films about) angels and demons/devils. Sound fun? Aimee has devised several different levels of participation and categories based on how many ‘demonic’ items versus ‘angelic’ items you intend to include on your list. Of course, it will be added to, altered and subtracted from almost immediately. Oh YAY so glad you've joined :D Can't wait to see what you thought of that movie - Id never even heard of it before!!! I'll post a different post and a different post for Mr Linky and ill let you know when its up. There are so many good challenges out there! If you need some demon books check out Gena Showalters Lord of the Underwold series. They are yummy! Okay, this challenge looks awesome. I was going to try to not join any challenges in the first part of 2010, but I may have to make an exception. Love the button, love the name. Curse you, blogging world! Coool challenge. I like halos but I never read horns. Can't wait to see what you pick. This sounds like a cool challenge. I have not commited to any challenges yet. I feel like I am challenged to just get through the books I have here along with what I have on my list. Maybe I will have to look through my list and see what I have that falls the most in any challenge area and pick that challenge for next year. Yeah, it's gonna be fun! Thanks for checking out my blog! ooo, i have kushiel's dart in my pile. i'll read it too and we can compare. This is a really cool challenge. Have fun!